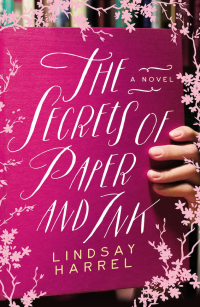 Today on Writer Wednesday we welcome Lindsay Harrel, author of The Secrets of Paper and Ink. Enter below for a chance to win a copy of The Secrets of Paper and Ink! Winner announced right here next week. Congratulations to, Chanel Monroe, the winner of Jaime Jo Wright’s The Curse of Misty Wayfair! Please e-mail my assistant Christen with your mailing address! Note: This post contains affiliate links. 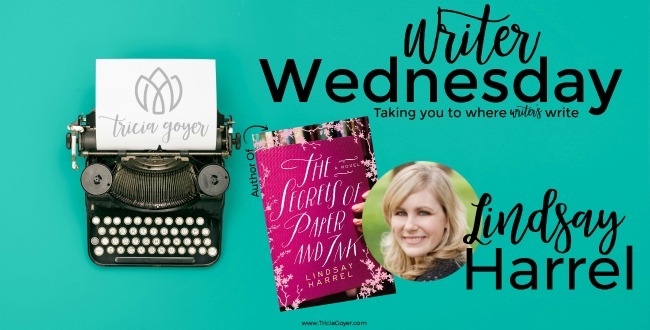 Lindsay Harrel the author of the new book The Secrets of Paper and Ink shares a day in her life on today’s Writing Wednesday! People often express amazement at the fact that I can find time to write with two little boys at home. My days are filled with Paw Patrol, Ninja Turtles, and PJ Masks. I break up fights between my four-year-old and nearly two-year-old more times than I can count in between doing the dishes, making the next meal, and staring down a pile of laundry (that, quite honestly, rarely leaves the basket folded). But one of my good author friends told me this before I had my first child: you find time for the things you’re passionate about. And, even though there are many times I wish I could do more writing and less chasing of toddlers, I have somehow found the time to write at least one book a year plus market and be active on social media. Actually, “somehow” isn’t really accurate. I know it’s God’s blessing that’s allowed me to squeeze extra time out of the few precious hours a week I have to write. That, and the generosity of my mother-in-law and step-mom, who watch the kids for me once a week. Oh, and the support of a husband who believes in my dreams. I’m definitely blessed. 5:45/6 am: Wake up and make my husband’s breakfast and lunch before he heads out the door. 7 am: Kids are up! Make breakfast, eat breakfast, clean up breakfast. 8 am: Get everyone ready for an outing of some sort. 9 am: Outing of some sort (because staying home too much drives me bonkers with two littles! ): Bible study, gym, Costco, etc. 12:30pm-3pm: Naptime!! Which means this is my prime working time! If I’m drafting a book, I aim to write one scene. If I’m revising or writing a blog post, I just do as much as I can in this time while my kids nap or do quiet time. It makes for a long quiet time for my four-year-old, so my time has been more interrupted lately than I like. 3 pm: Reading with my oldest; “school” for him (I just do some activities out of a book); kids play while I do household chores, start dinner, etc. 7:30-9:30 pm: Me time!! I used to work during this time, and I still will if I’m on deadline. However, I’ve found that I need to refill my tank if I’m going to have any sort of patience with my kiddos the next day. So, I try to read and sometimes watch television during this time. Also, this is my time to hang out with my husband apart from our family times in the evening. 10 pm: I aim to make this bedtime! Sometimes I get really sucked into a book (you know how it is, I’m sure!) and stay up later. On Saturdays, I clean the house and meal plan. Sundays are for church, family time, and rest. If you’re a writer and wondering how to get everything done when you’ve got a busy life, just remember—one day at a time. One scene, one chapter, one book at a time. You’ve got this. If you’re passionate about writing, you’ll make it happen, even if it’s not as much as you’d like it to be at the time. I know there will be a time when my kids won’t need me as much and I can write more. For now, I try to lean into my season of life and be grateful that I still get to do what I love while raising my kids. 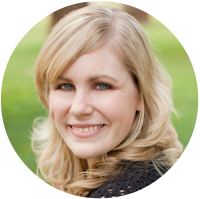 Lindsay Harrel is a lifelong book nerd who lives in Arizona with her young family and two golden retrievers in serious need of training. She’s held a variety of writing and editing jobs over the years and now juggles stay-at-home mommyhood with writing novels. When she’s not writing or chasing after her children, Lindsay enjoys making a fool of herself at Zumba, curling up with anything by Jane Austen, and savoring sour candy one piece at a time. The Secrets of Paper and Ink. New from author Linsday Harrel. 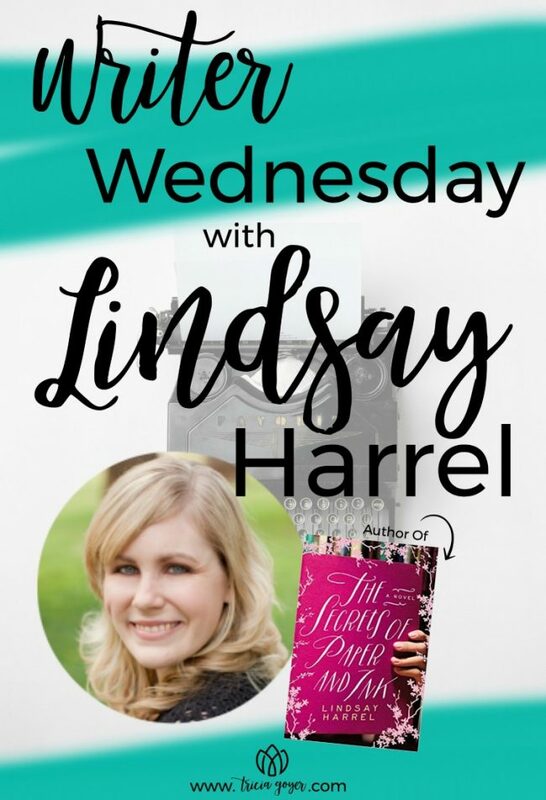 Lindsay Harrel shares a peek into her everyday writing life + is giving away a copy of The Secrets of Paper and Ink on this week’s Writer Wednesday. Wow, I’m amazed at your ability to get work done with all the other stuff you do. Good for you! I’m so looking forward to reading your new book! I remember the days of having littles! I worked and it was difficult. Writing a book would have been out of the question. I admire your perseverance. Your kids are cute! Your book sounds great! Thanks for the opportunity to win! I enjoyed reading about your daily life and how you make writing happen. Your book sounds interesting and I would love to read it. This story line is intriguing and the characters sound very interesting! It’s nice to get a behind-the-scenes look of your day-to-day. And I’m so glad you are willing to make time for writing. Congrats on your upcoming release! And I love the book cover! Gorgeous! Would like to read this book. You sure have a busy schedule. Sounds like one of our pastor’s wife who has to juggle 4 kids and on-line teaching pl;us being a pastor’s wife. Its sounds like you have it all together. I have had a similar schedule with other work minus the writing, I am a reader. Remember it is very important not to skip your recharging time. Wishing you the best. Sounds like you get quite a bit done! I am married, but no kids, run a small business, and I feel like I should be doing more than I do.